November 19 -- For many Farmington area residents, this year's Thanksgiving dinner will be especially memorable for one special reason: it will be the first time that their Thanksgiving turkey and other holiday food items have come from a Schnucks store located in Farmington. Over the years many local residents did of course shop at a Schnucks store, but until today, those shoppers had to travel to Festus, Cape Girardeau, or the St. Louis area. 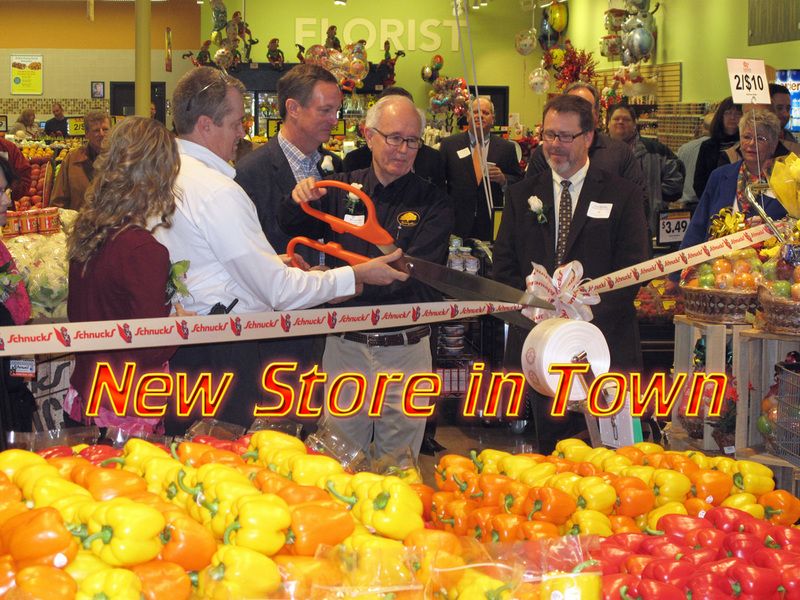 All this changed at 9 a.m. this morning when store owners, staff members, and local leaders led by Mayor Stuart (Mit) Landrum celebrated the new Farmington store in a joyous ribbon-cutting ceremony. "This is the most anticipated retail event in probably the last 50 years in Farmington and we're just glad to have them," Landrum proclaimed. In his remarks at the opening ceremony, the Mayor noted that city leaders had worked for many years to attract a major grocery store such as this one to the local area. Representing store owners was the firm's chairman and CEO Todd Schnuck, who noted that the firm was first begun 75 years ago by his grandmother. That store, he pointed out, contained 1,000 square feet of space. This new store is 61 times larger, he said. Also present at the opening ceremony was the new manager, David Alcorn, who interviewed most of the 1,200 applicants for the store's 100 job slots. Following the ceremony, early shoppers were treated to coffee and cake as they flooded into the store. During the daylight hours, the outside parking lot was jam-packed with cars and carts. No doubt many of those who will be enjoying their Schnucks' Thanksgiving turkey next week will be thinking that Christmas has come a little early this year.